Although not crude, the studio was very basic. Records (remember them!! - Ed.) were played on two BSR turntables fitted with ceramic catridges. A profesional electret mike was used for voice and jingles were played on a high quality stereo cassette deck. A simple five channel mixer was used to pipe the studio output to be recorded onto TDK AD cassette tapes via a sharp stereo tape deck. 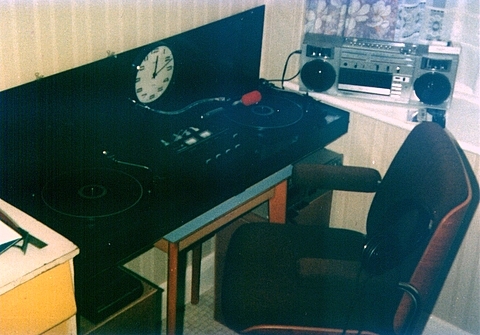 Surrey sounds never broadcast live due to the risk but instead used a battery powered mixer on site to mix in a station jingle at the top of each hour as the main programme tapes were changed. Accurate time checks by the DJs added to that 'live' effect.